Casserole with generous shapes and sleek lines. The original shapes designed by the designer Jacky LE FAUCHEUR make them a useful and a beautiful objects that enhance your table. 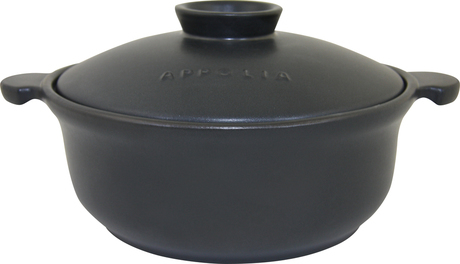 Tip : The black lid rests horizontally on your work-top which can help you preparing your recipes or simply can be useful to put on your kitchenware or cookware. Lamb stew, beef bourguignon,etc...fully enjoy slow cooking and flavours. Specific designed handles improve the grip even when using oven gloves. Drops of water from the lid keep the dish hydrated and enhance better flavours. By adding ice cubes Inside the lid's knob you increase the condensation factor. Extra wide knob gives optimum stability to the lid when placed upside down.